Herbs are plants used for culinary and other home uses such as sachets or safe household insect repellents. Several popular perennial herbs will thrive and overwinter in USDA hardiness zone 5—those regions of the United States where the average coldest winter temperature is between -20 and -10 degrees F. Certain tender perennials can also grow in zone 5 as container plants, and brought indoors in winter. English lavender (Lavendula angustafolia) has been one of the most prized herbs around the world for centuries. Lavender is hardy through zone 5, according to the University of Colorado Extension Service. Lavender is available in numerous cultivars, each with slightly different growing habits, scent and color, but most lavenders have gray-green leaves and spiky purple flower stalks with a heavenly scent. Grow lavender for fresh or dried flowers; sachet material; and in perfumes, soaps, candles and wreaths. Lavender is also a culinary herb; the edible flowers can be added to cakes, iced tea and salads. Also, this plant looks beautiful in perennial flower beds. 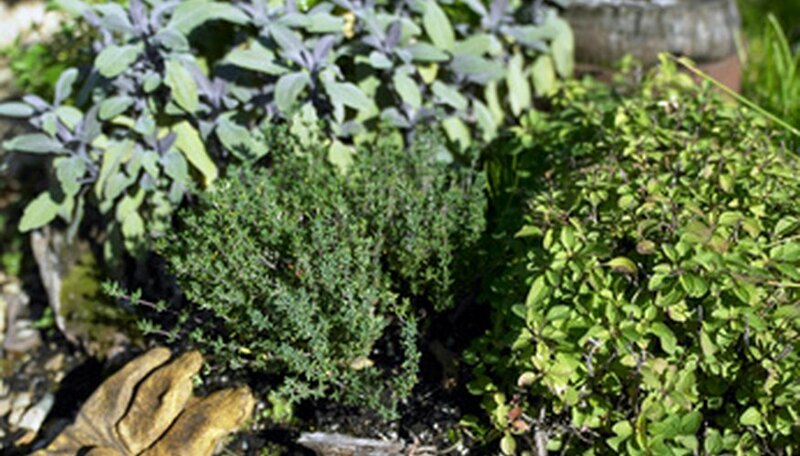 In zone 5, herbs such as catnip, mint, lemon balm and horehound are grown for relaxing herbal teas, according to the Utah State University Extension. Chamomile also thrives in zone 5, and is hardy as far north as zone 3. Each of these tea herbs shares the characteristic of expansion, and can take over your garden if you do not exercise caution. Plant them in a sunken container to limit their wandering, or plant them to cover a bank or a corner of the yard that doesn't have to be mowed. Cut the stalks of the tea herbs in early autumn, hang them in bundles to dry and strip the leaves off the stalks into air-tight containers for herbal tea all winter. North Dakota State University Extension's list of the top 10 culinary herbs for growing in the northern plains region, located in hardiness zone 5 or colder, includes anise hyssop (a native member of the mint family), basil, chives, dill, oregano and tarragon. Basil is an annual to harvest before night temperatures dip below 40 degrees F; otherwise, a bitter taste is produced. Chives, oregano and tarragon will overwinter in zone 5 to return the next spring. Dill may be grown as an annual or allowed to seed itself in for resprouting the following year.